Gasgacinch performs exceptional compared to other sealants that are pasty and thick. 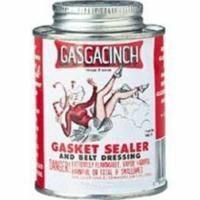 Gasgacinch gasket sealer remains flexible and makes it easier to assemble and disassemble the engine or transmission. It adheres to carbon steel, alloy steel, aluminum, titanium, lead, magnesium, synthetic and natural rubber, copper and cork. The sealant adheres to carbon steel, alloy steel, aluminum, titanium, lead, magnesium, synthetic and natural rubber, copper and cork. Gasgacinch gasket sealer may be used in hot, cold, wet, dry, acid, basic, and abrasive environments. Gasgacinch, when cured, is flexible, has high-peel strength, high-shear strength, fatigue resistant, vibration dampening, high heat resistance, gasoline resistant, and oil resistant. If you have any questions about this product by Gasgacinch, contact us by completing and submitting the form below. If you are looking for a specif part number, please include it with your message.